The next door was an apartment construction, so I could not concentrate on my work because of the loud noise every day and bought it. The noise was halved and I think it was good because I could hear the sound of the phone My ear hurts if I wear it for a long time, so I put a mini hand towel over the hit part. This review is about item#8216756. We could not get enough performance with the ear muff we are currently using, so we bought this item. I am satisfied with the performance as expected. It was good that machine noise etc was suppressed. Even if the work was done until now, the tinnitus was keen and it was lost after wearing. This review is about item#08216756. It is standard as a type covering the entire ears. Depending on the user, if it is worn for a long time, the spring pressure is too strong. As usage situations, there are many high-frequency fan noises, so it may not be necessary for "extreme noise work type". Maybe it was over spec. Conversely, the sound insulation is good accordingly. Soundproof performance was good and the fitting feeling was soft and easy to put on. There is an extraordinary muffling effect than the ear muff I used before. The tightening direction is also moderate, and headache does not occur even with long-term use. Compared to the headphone type I used before, my ears should not hurt. Good sound insulation. This review is about item#8235455. I can adjust the length, it fits perfectly. I could work comfortably even in noisy noisy ears. You can not hear the conversation of other people and you can focus on the design work. Incorporating Bluetooth headphones and listening to Raiko. It is surprisingly sound insulation compared with what I used before. I'm stressed because noisy noises do. In the photo, I thought that I could use it because I was using a helmet and I could hit the helmet and not use it. This review is about item#08235455. Soundproofing is very satisfying. I feel that the stay portion is a bit small. I am using the stay set slightly later than the head top. I am working on a very noisy scene. Since I started using this earmuff, my ears no longer exist and I am saved. I can do normal conversation. It's really nice. The vibrating screen machine is in operation and so forth etc. Only a few dB insulation is only higher than the person who used it conventionally, but I purchased it thought how it was, but that number dB works! I am very satisfied. However, since the power to pinch from the left and right is quite strong, there may be some people who feel pain with long-time use. It seems almost perfect if this can be adjusted. There was an Air Self Defense Force near my house, and the explosion of flight training during the day was quite large (sometimes it exceeded 100 db), so I worked outside the house (rehoming of the house and garden messing) and saved pretty much the tres . At such time I knew this product, it was data with high attenuation effect, and I bought it because the manufacturer was relieved with 3M. The flight noise of the airplane when attached was reduced considerably. Although it was good only by this, I could also wear earphones without any discomfort, so it was a fun work while listening to radio broadcasts. 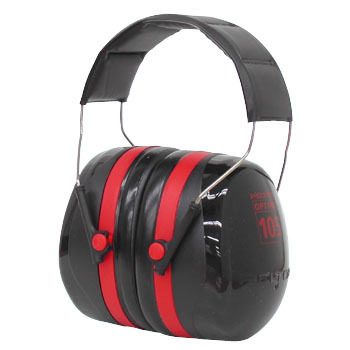 One discontent is that when you use for a long time, the part to which the earmuff hits hurts, but this is due to the fact that the spring is strong in order to get close contact with the earmuffs in terms of performance, but it may be inevitable I do not. Until now when working with a tractor I was working with stuffed tissue paper in my ear but after work I found that my ear was still ginging and I searched for something good, this product was found, noise Although it is surely reduced, since the headband does not stretch, it requires a hang, headphones etc. will stretch even for items of 100 yen shop, so I do not think there is no thing 3 m in the world can not do.